Visitors to Rome always want to see the same things: The Vatican. The Colosseum. The Forum. Once you've visited those, and you would like to take a little break from the crowds, we suggest alternatives to the typical Roman visit, like these five of our favorite historical sites nearby the ancient city. Lesser-known, and visited by far fewer people than the familiar sites in Rome’s bustling centro, they offer visitors a chance to take in every bit of the beauty and antiquity of this storied empire, without being caught up in jostling swarms of noisy tourists. 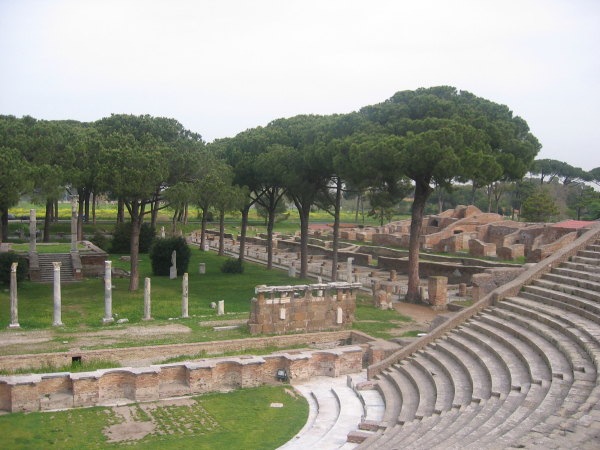 Just a few minutes from Rome's airport lies Ostia Antica, the ruins of an entire sprawling Roman city. Ostia was the port town to Rome in the days of the Empire, and was therefore a thriving center of commerce as well as the home of many members of the merchant class. Today a visit here is a 2000-year step back in time: Walk through the ancient, cobbled stone streets and buildings; find remnants of frescoes and mosaic art, statuary and sculpture; sit in the bleachers of a Roman theater; and marvel at the architecture of the great Roman Empire. There is even a bar here - but it’s been closed for some two thousand years, so bring your own beverages. 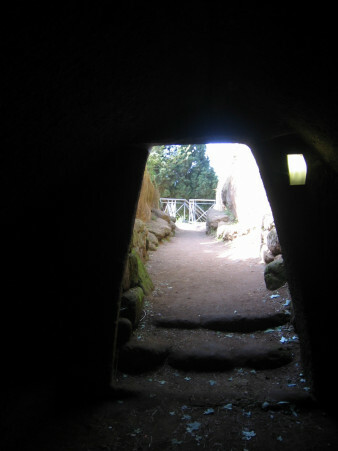 About 30 miles northwest of Rome is the Necropolis Etrusco, just outside the town of Cerveteri. These burial tombs date back to the 9th century BC, built by the Etruscan people whose culture spanned the peninsula for several centuries before the Romans. The tombs are carved out of the “tufa” rock, the soft volcanic material found throughout central Italy. They are laid out over a large acreage in a city-like pattern, complete with “streets” and “neighborhoods” – hence the term necropolis, or “city of the dead”. A walk around this “city” imparts a sense of the tremendous passage of time, as well as a sense of the spirituality of these ancient people, thousands of whom were entombed in these great structures. Upon entering some of these tombs, the temperature seems to drop dramatically. Give a listen to the resonances in these chambers: Try finding the note that the room is attuned to and singing it – the resulting sound is as chilling as the cold stone. Another eerie, ancient burial site, the Catacombe di San Callisto are to the south of the centro, within Rome's ring highway,. These catacombs are among the biggest underground cemeteries in all of Italy, the burial site of Christian Romans of the 3rd century. Among those interred there: Nine popes of that ancient era, and Saint Cecilia, the patron saint of musicians. (Knowing that the “residents” of these catacombs have been dead for a mere 18 centuries rather than 3000 years is of little comfort when wandering the dark passages.) Visits here are guided only; group tours are announced regularly, in several languages - just wait until they call your language and then join the group. Ancient Rome’s water supply system was a marvel of engineering and a necessity for such a populous city to thrive. The Parco degli Acquedotti in the southeast outskirts of Rome (also within the ring road) is on protected land, which is why it has sheep grazing around it instead of being surrounded by condos or shopping centers. Here stand the remains of this remarkable public works project. This section of the aqueduct (called the “Claudian”) was started by Caligula in 38 AD and completed 14 years later by Emperor Claudius. It carried almost 600 gallons of water each second into ancient Rome. Today, runners, walkers and bikers frequent here – the paths are wide, the view is stunning and the terrain is flat. This stretch of aqueduct has appeared in many films and TV shows, including the great HBO show “Rome”. The town of Castel Gandolfo, 15 minutes from the outskirts of Rome, is well-known as the summer home of the Pope. The highly-manicured Papal Gardens have been closed to the public for centuries, but the current Pope recently declared them open to visitors. (He also refrains from summering there, regarding the extra property as an unnecessary indulgence.) The cathedral on the central piazza is appropriately elaborate, befitting the importance (or self-importance) of previous pontiffs. The historic town is perched on one edge of a caldera lake - a former volcanic crater, so the lake is surrounded on all sides by steep hills and cliffs. Some of the hotels and restaurants have gorgeous views overlooking the waters, making the place feel like a luxury location. There are only a handful of streets in the centro, many of which are cute and narrow residential blocks. Of course it’s important to visit Rome's Forum and Colosseum, but these alternative sites are great options for day trips from Rome for travelers wishing to skip the crowds and get off the beaten track. Yes, I want to travel like you guys!